Hopefully this will be the least updated page on our entire site, but we wanted to have a place to honor the memories of some special RSF horses lost recently. We miss them all very much, and send condolences to their owners for those who had moved on to new homes. Dhaimler developed pneumonia which we treated aggressively, but the bacteria seeded itself to multiple joints so the difficult decision was made to put him down. Birth report:Dhaimler was born in the evening around 10:30, so it was quite convenient for sleep afterward. He got right up, nursed, pooped and was active. 2018 has been a BAD Year. 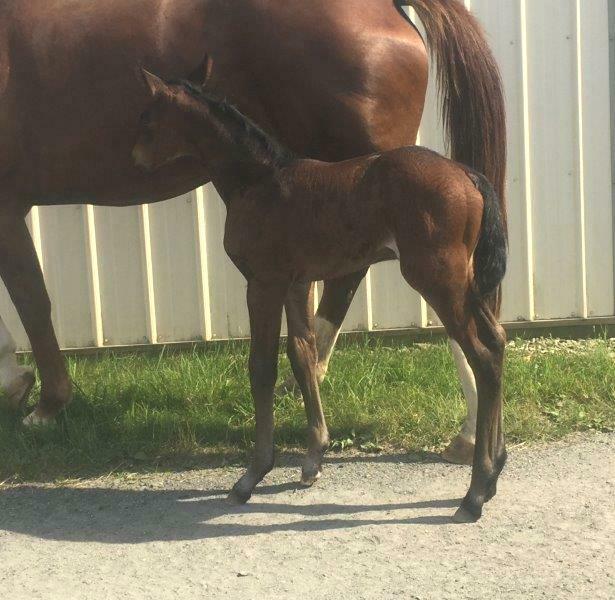 This filly slipped under the fence into a different paddock. The next day, she was not quite right. Radiographs revealed a broken condyle of the femur. I sent her to our local equine hospital where they performaed surgery to put in 2 screws. About 5 days later she was dead later. Infection had set around the screws and into the joint and growth plate. We sadly had to put her down. 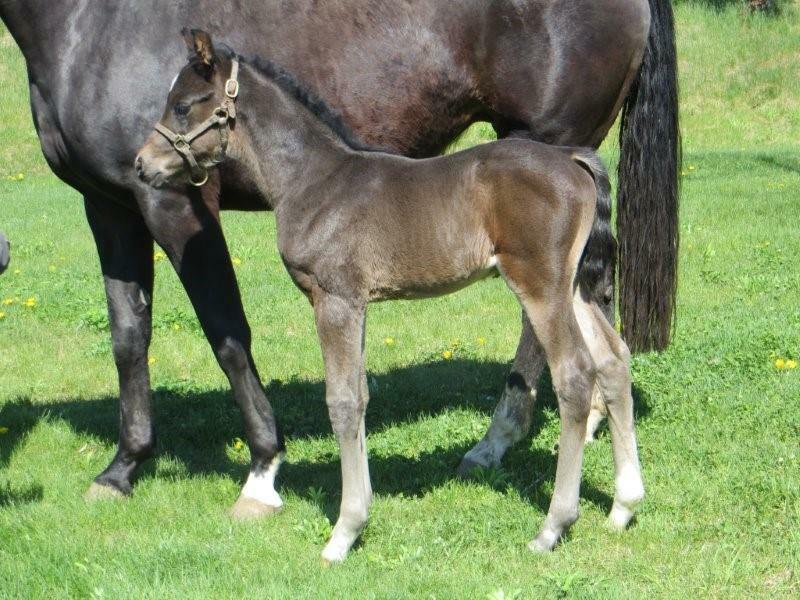 Birth report: My granddaughter Kaylee and I stayed up watching to make sure everything was OK on this lovely filly from one of my best mares. She's very pretty with a very free shoulder. Lhuau was named the Champion 3 & 4 year old mare of the inspection with highest score of the day. 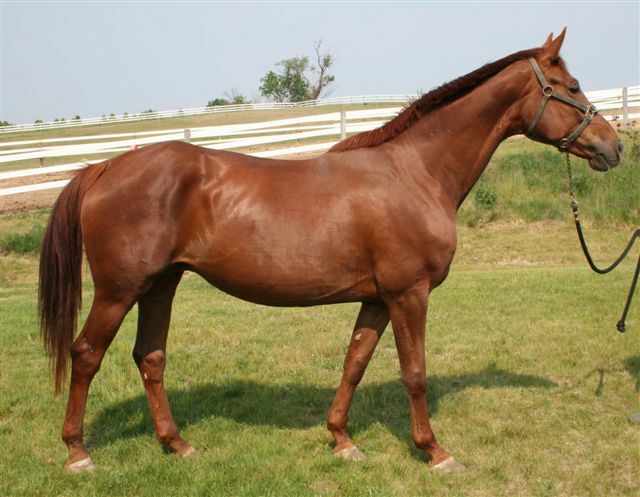 She received a 7.33 with a 9 for the head, and 8's for typiness/femininity, corresctness of gaits, and impulsion in the trot. She received a 7.25 for her MPT score, the third highest score given. Scoring was very tough and the audience was quite surprised, since it was a high quality group of mares. 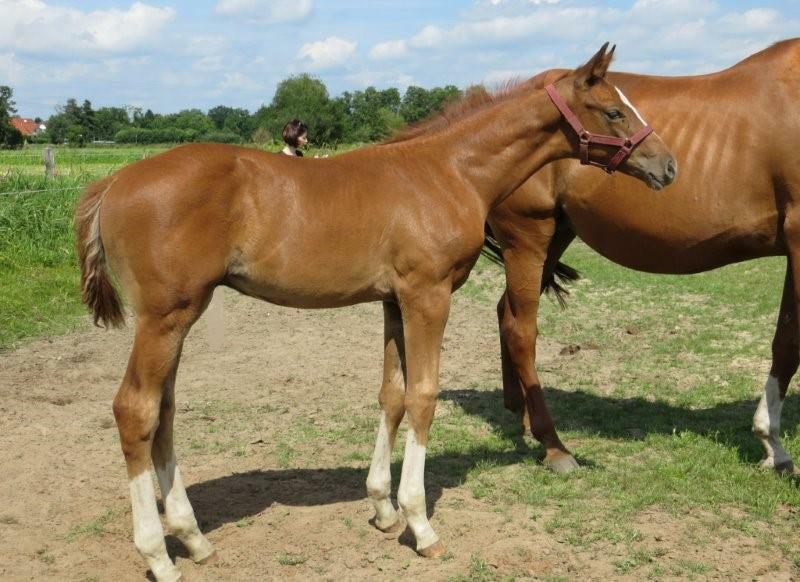 I don't need 4 S line stallions, although I love them all- this one can be your breeding stallion and riding horse at the same time. FEI potential here! This pedigree is made for the dressage ring. Dante Weltino is a rising Grand Prix star in Germany and EM Rheporter was Grand Champion at Dressage at Devon in 2011 and reserve champion young horse in 2009. She is a stallion mother (Shavane) and her daughter Shcooter was reserve champion Filly and Champion Young Horse at 2015 Dressage at Devon. Dhubonnet is a real long legged beauty. Movement is amazing- one of the best movers I have ever bred. SOLD! Congrats to Heather Mendiburu of NJ! An abortion that tried very hard to happen.... Tyra was not due until mid June. 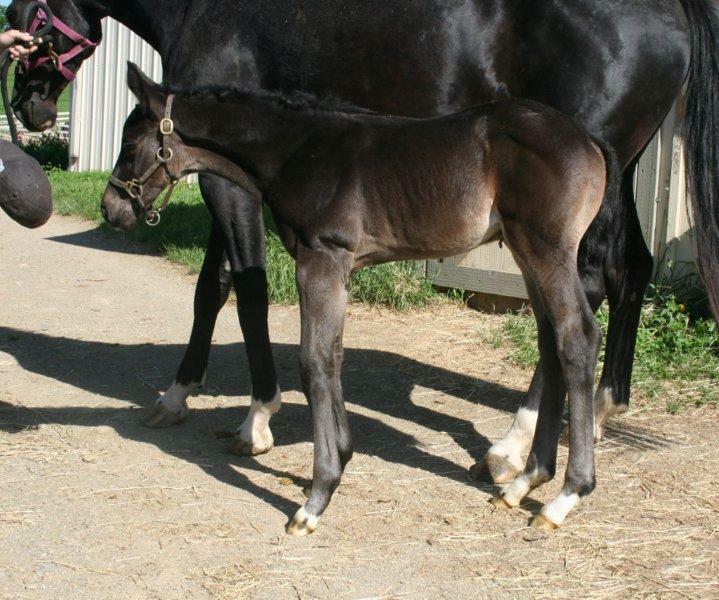 This colt presented as a pretty bad dystocia and I was happy to have enough experience to get him out. He was born with very contracted knees and fetlocks and was unable to stand and nurse, even after we put casts on his legs. We bottle fed him for 24 hours, but Gharbo was becoming uninterested and her milk production was decreasing (we think she knew the colt had no chance), so we put him down. 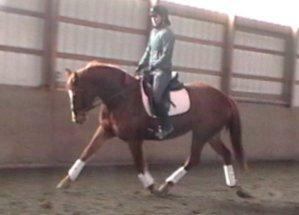 Sire, Weltbekkant, has been an extraordinary dressage competitor. 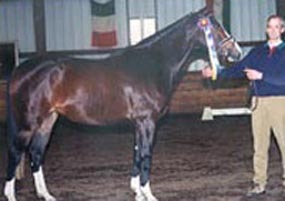 In 1998 he was 2nd in the USDF Horse of the Year awards at Second Level and awarded Champion Hanoverian Second Level Horse. 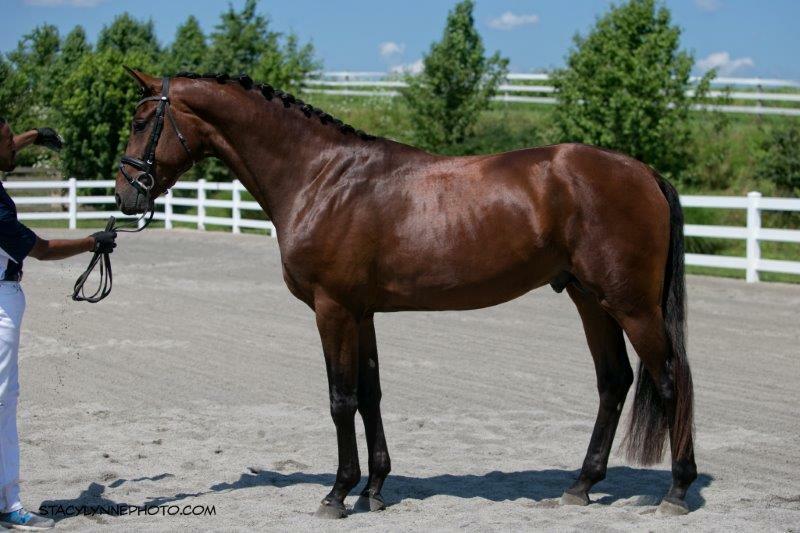 He was USDF's Third Level Horse of the Year in 1999, and was also awarded Champion Hanoverian at Third Level. He continued his great successes with Fred Weber in 2000, by winning ten Fourth Level Tests and being awarded Champion Hanoverian Fourth Level Horse, and in 2001 by again being awarded Champion Hanoverian at Prix St. George. 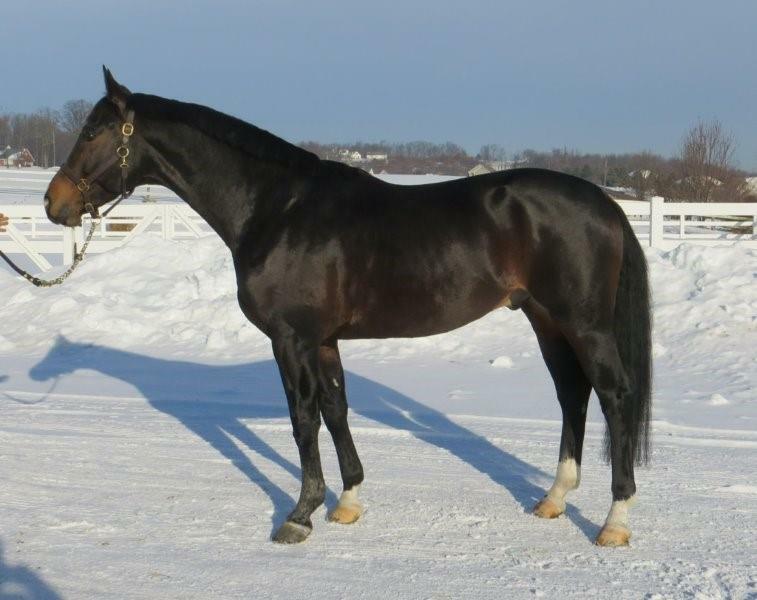 He was one of two homebred stallions licensed on July 23, 2012. I gelded him in the fall of 2013. I had to make a decision about whether or not to send a second stallion to the 2013 70 day stallion test in OK. I decided that, since I stand Shotgun's father, Shakespeare and it would cost another $15K to send him, I made the decision to geld him. 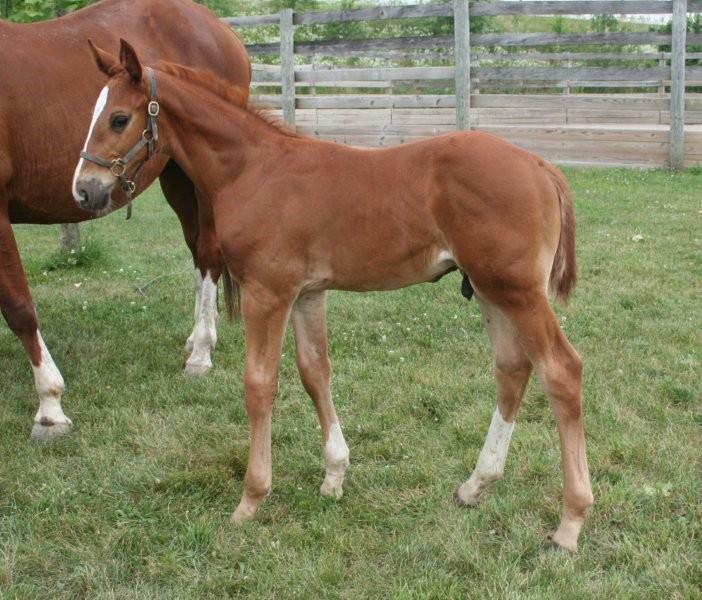 This was a really special colt who was accidently kicked by his mother in the pasture. This happened on May 8, when he was just one week old. We saw it happen, and were there within minutes, but he was already in shock. He was dead within 30 minutes, most likely from internal bleeding. We are so sad. Her sire, Wolkentanz II was a highly placed finalist in the 1998 German Championships. 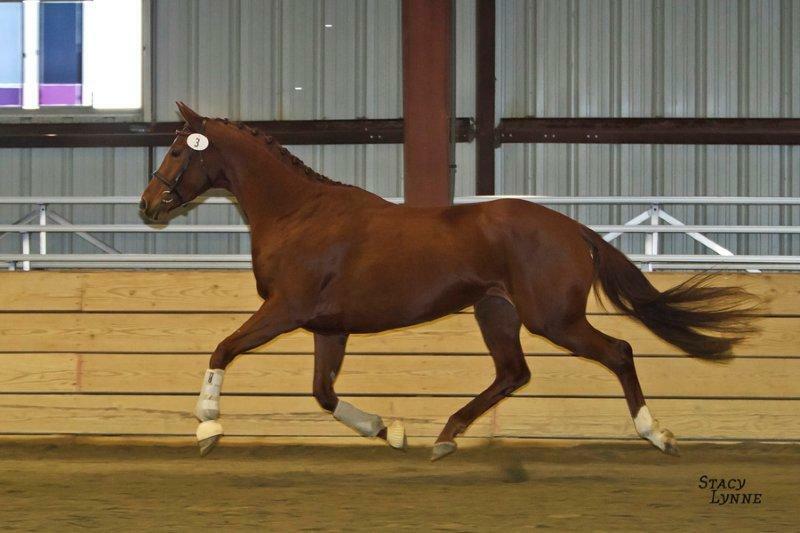 He was runner up in his stallion performance test, winning the rideability portion with a score of 143.94. He won the International Dressage Festival in Lingen with a score of 9.6 and was a finalist in the six year old dressage horse category in Warendorf in 2001. He is trained and competes so far up to PSG level. Whest Indies dam is Rhococo. Hhors is a dream to ride even though she is just green broke. Beth had NO problems and everything that is asked of her, she does like she wants so bad to please. Easy, easy, easy! 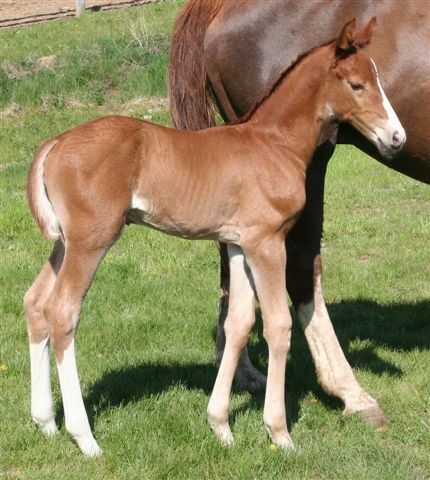 Not so tall- perfect for the smaller amateur rider or breed her because of her rare bloodlines. She participated in the GOV Mare Performance Test at our farm on July 13th, ridden by Lauren Casale, who is the daughter of Sue, her new owner. She received good scores overall. Sue and Lauren have already taken her to a local hunter show, where she won all of her classes! We had to put Bhaltic down. He had a really long neck and exhibited severe signs of being a wobbler......RIP sweet boy. Fhandango presented with a severe colic, most likely small intestine, on the morning of July 14. Pain meds did nothing and it was decided that surgery would be risky. He was put to sleep- it was the right decision. 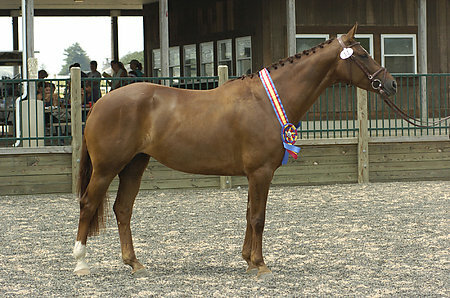 Glimmer received a score of 8.0 on her inspection and was the high score mare at her inspection in 1993. Her sire is the famous Grundstein, also sire of Gold Luck. 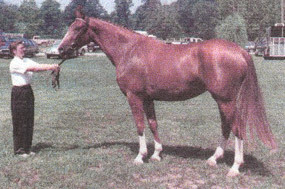 Her dam, EM Pik Koenigin (Pik Bube-SPS Salona/Saloniki) was champion mare, Moorpark, Calif., 1986, champion performance test, Moorpark, Calif., 1987, and Region 3 Champion, Training Level, Fla., 1996. She also produced Graefin (also by Grundstein) who was Champion mare with 8 on her gaits score at the Oklaoma inspection, 1992. 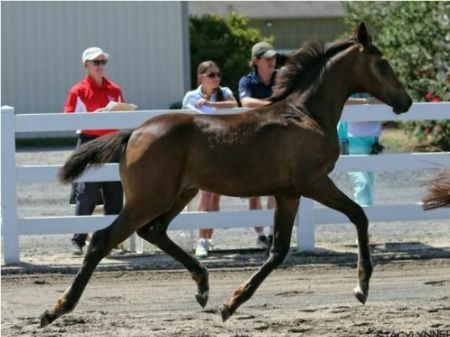 At our AHS inspection, Ghlycerine was shown in the Mare Performance Test by her amateur owner. 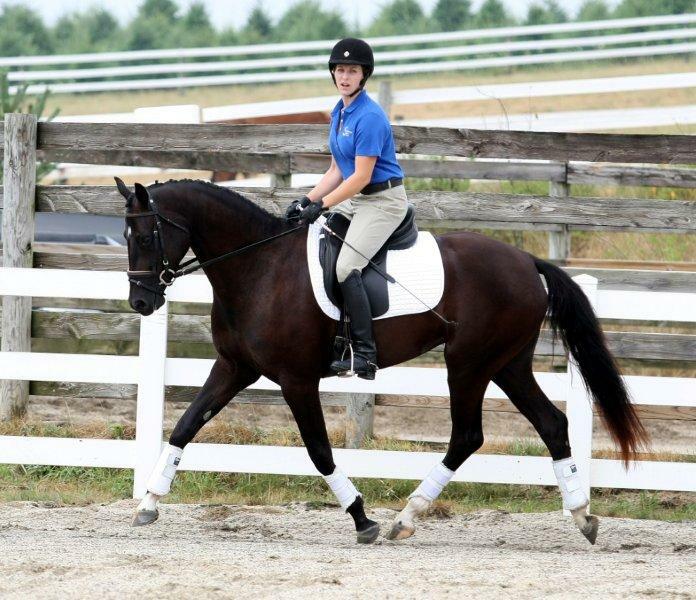 Despite an average jumping ability (2 6's), she received an overall score of 7.11 with 8's for canter and rideability. She has an ET foal coming by Pablo, so hopefully next year she will become an Elite Mare. Congrats to Kris! Heartfelt sympathies to Kris Schuler of Fleetwood, PA on the loss of this outstanding mare.